When you are starting your bullet journal for the first time, you might be overwhelmed and confused by all the symbols and icons used in daily logs. There are boxes, arrows, lines, dots, circles, stars, exclamation marks, envelopes, light bulbs…. what do they all mean? 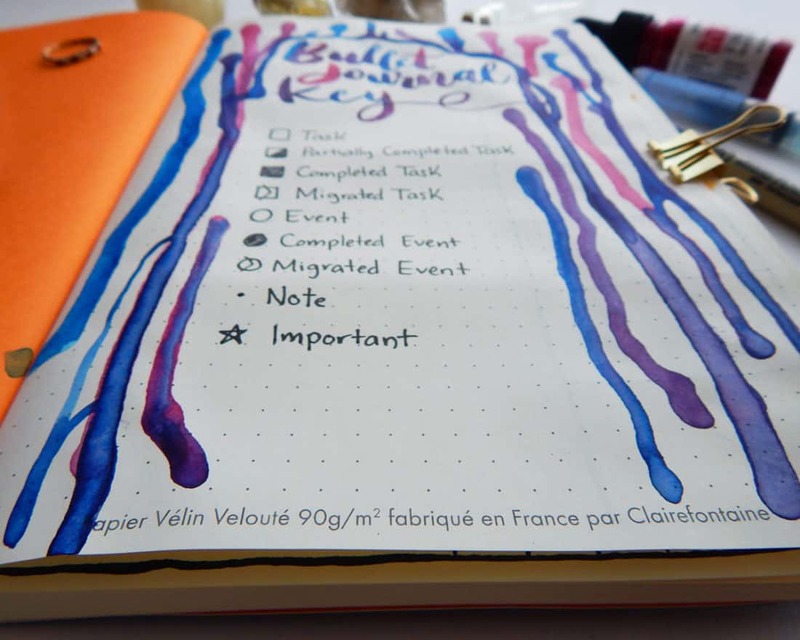 How should you use them in your bullet journal? I’m going to show you not only how to pick the icons that work best for you, but also how to keep them straight with the help of a bullet journal key. Ready? Let’s go! The best advice I have for you is this: keep it simple, sweetheart! You don’t need a ton of different icons because you can really boil it down into only a few basic ones. When I first began my bullet journal a few years ago, I thought I needed specific symbols for specific tasks: send email icons, make call icons, research icons, purchase icons…. I discovered pretty quickly that I didn’t care. When you’re rapid logging, you don’t have time to draw out a little icon for every little task. You can successfully plan and organize with only the basics. Here’s what I used on a daily basis! Yup, that’s it! A total of nine icons see me through the chaos of my life with ease. It’s really that simple! 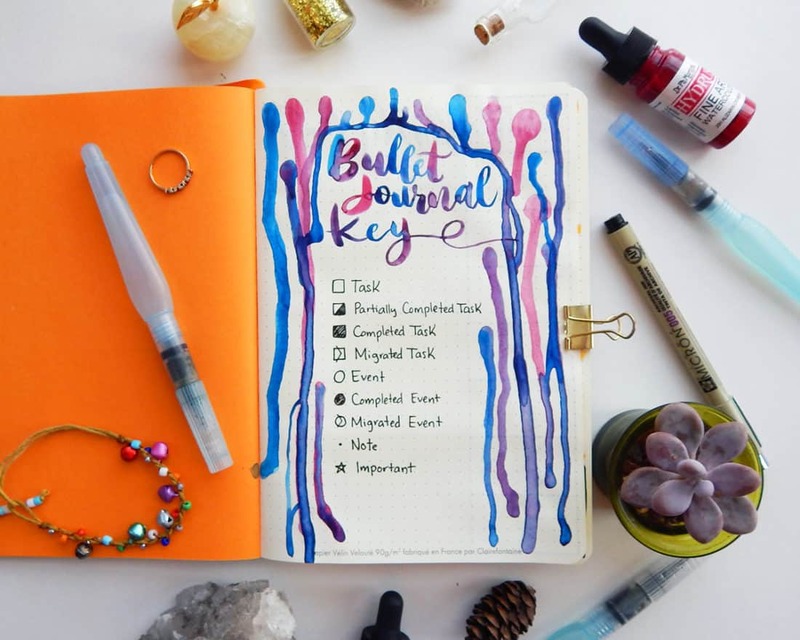 Of course, you don’t have to use this exact bullet journal key for your planner. Mix it up if you like! I know some people don’t like drawing out the boxes for tasks, so they do a dot instead. When the task is complete, they put a big X through it. I feel more accomplished when I fill in a box, but that’s just my preference. You might prefer an arrow instead of a bullet for a note, or an exclamation mark instead of a star for importance. Do whatever feels right for you! If you keep your icons simple, you likely won’t need to keep a bullet journal key. But it is nice to have a key for a few reasons. One, it makes your bullet journal feel a tad more official. Two, it’s a great option if you’re nervous about the first blank page of a journal. And three, it gives you an opportunity to play with a style or new pen – and who doesn’t love that? I feel like the bullet journal key is often so boring. So I like to jazz it up! I’m always looking for an excuse to try new techniques, especially with watercolor. My bullet journal key ended up being a guinea pig for crazy watercolor drips, and I love it! I’m using a Rhodiarama soft cover notebook, and the paper handled it beautifully if you were wondering. I just used my Dr. Ph. Martin’s Hydrus watercolors and Pentel Aquash Water Brush Pens to apply fat drops of color at the top, and I tilted the journal and let them roll to the bottom. It’s super easy if you want to try it! Just go slow and have a few paper towels on hand to clean up any stray droplets. It also helps if you use a pen that won’t bleed when it gets wet for the icons. I’d recommend Pigma Microns for exactly that reason. They’re superb with watercolors, and they’re great for just about anything else, too! If you don’t want to make your bullet journal key take up a whole page, you could simply stick it in the back for easy access. 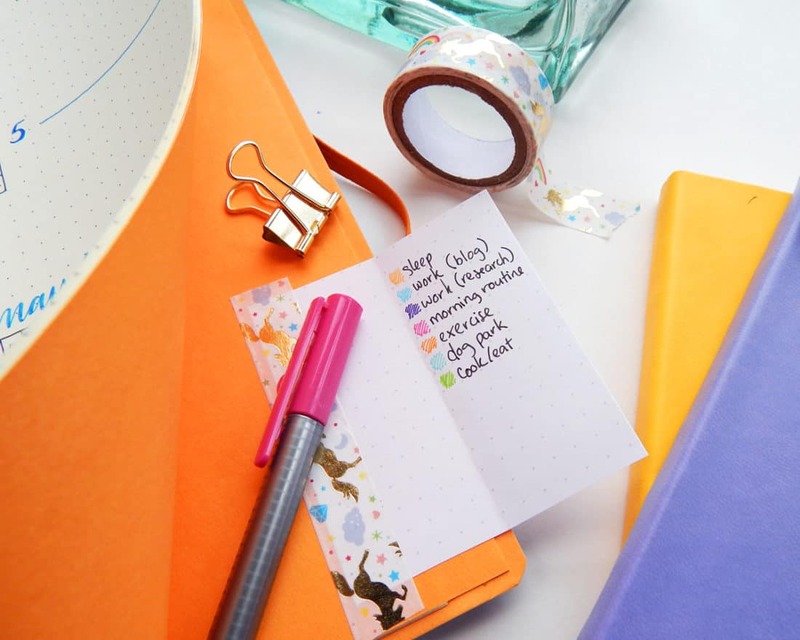 Take a piece of paper, draw out your key symbols, and tape in on the inside of the back cover with your favorite washi tape. You can flip it out when you need it and remove it later if you decide you don’t need it. Easy as pie! Here’s an example from my 5 Weekly Bullet Journal spreads post. It doesn’t have to be complicated or elaborate or anything. 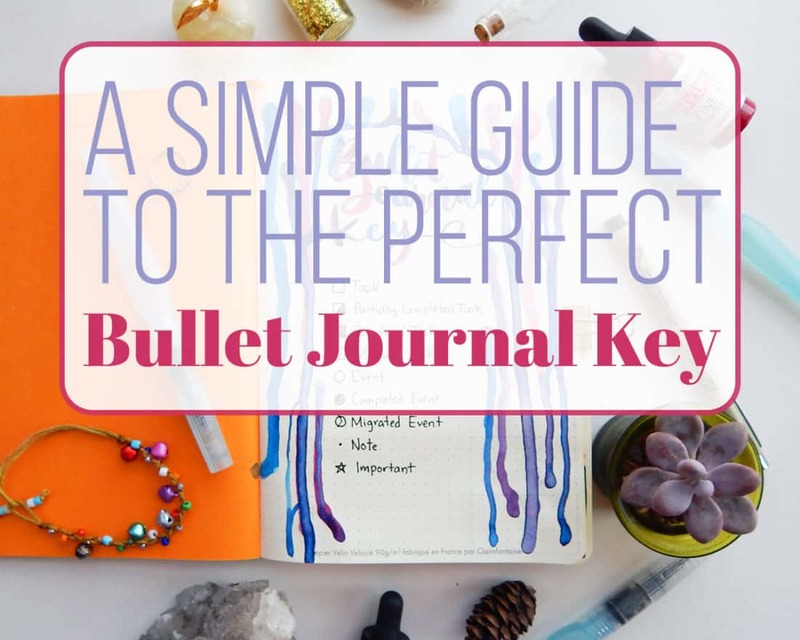 Your bullet journal key is just a great thing to add to your bullet journal, plain and simple. It can help you with those tricky first pages, boost your confidence by letting you play with techniques, and generally help you streamline your bullet journal process. And it’s perfect for a bullet journal newbie or an experienced veteran. All you gotta do is pick up your pen and start! I’m pretty sure I got it from a CrateJoy.com subscription box, but I honestly do not remember for sure!